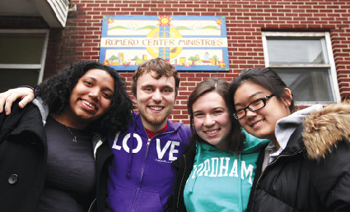 In a blighted section of North Camden, N.J., Fordham student volunteers don’t have to look far to find the presence of a higher power. GO! Camden students (left to right): Aisha Blake, Dan Drolet, Allison Greco, and Michelle Ahn outside the Romero Center in Camden, N.J.
It’s between the lines in a story relayed by a diabetic undocumented immigrant, who struggles daily with a disease he can only get treatment for in an emergency room. It’s in the maternal glance of a woman watching over her sleeping brother, who is a homeless drug addict, high and slumped in a wooden chair at a public day shelter. It’s among the boxes of donations to a clothing bank, where those among Camden’s 56 percent unemployed can receive a free coat on a frigid day. And it’s in the instant communion between two lonely nursing home residents who have been introduced by volunteers and are now conversing over a meal. Students participating in last year’s Go! 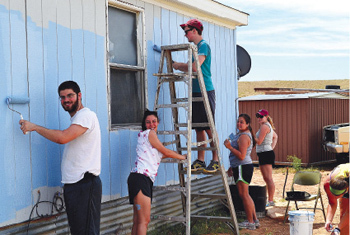 Navajo project painted a house belonging to Navajo elders in Blanding, Utah. Fordham’s Global Outreach (GO! ), a service and cultural immersion program, helps bring scenarios like these to students by providing volunteer opportunities both nationally and internationally. This year, GO! visits Camden and 32 other localities worldwide, bringing nearly 400 undergraduates face-to-face with the meaning of faith in, love for, and solidarity with communities that have been marginalized. Now in its 22nd year, GO! has become the largest Jesuit college immersion program; this year more students participated than ever, said director Paul Francis, with new projects to Detroit, Ukraine, Ecuador, the Dominican Republic, and Guyana. “GO! 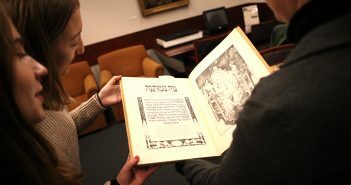 has a direct connection to the mission of Fordham as a Jesuit institution,” said Francis (GSAS ’03, GBA ’10), a former Jesuit Volunteer Corps (JVC) member. “We like to say that what you learn inside the classroom is enlightening; what you do outside of the classroom is transformative. Aisha Blake, a Lincoln Center campus junior studying information science, has experienced that transformation. Blake was so moved by her 2011 Camden trip that she joined the GO! executive board and worked to make certain enough applicants signed up for this year’s project—tempting candidates with brownies to get their attention. Blake recruited nine undergraduates and one recent graduate. The group spent part of winter break volunteering at service sites around Camden through the Romero Center, an urban retreat house and social justice educational center. What is unique about GO!, Francis said, is an emphasis placed on community-building prior to the trips. Each team of 10 to 12 students strengthens its bonds through weekly meetings, fundraising, a retreat, and one-on-one sessions between members at which they develop close ties. Francis calls it a “spiritual element” of the program. That preparatory aspect of GO! resonated with Camden participant Charlie Martin, a Lincoln Center campus sophomore. Camden’s Romero Center puts its service volunteers through the Welfare Food Exercise. For 24 hours, Team Camden had to live on whatever they could afford to buy on a daily budget of between $9 and $12 for a family of four—approximately the same amount received from the U.S. government food stamp program. Abandoning any proclivities for vegan, vegetarian or organic cuisine, Team Camden ate hot dogs, white bread, eggs, cereal, rice, and Ramen noodles filled with plenty of corn syrup, sugars, and hydrogenated vegetable oil. On a bone-chilling Friday in January—the last day of service for Go! Camden—team members are assigned to work at the New Visions Community Day Center and Free Store, which provides clothing and meals to 175 impoverished residents daily. no drugs, no weapons, no fighting, and respect for everyone there. Dan Drolet, a Lincoln Center campus senior with a small patch of day-glow yellow hair, strikes up a conversation with an unemployed ex-Marine and ex-con. In spite of enormous differences in opportunity, Drolet said he can identify with his conversant, as well as the others at New Visions. “These are not broken people,” he says. “Homelessness isn’t chronic. They will get back on their feet. Many GO! participants, Francis said, develop a lifelong interest in doing service after experiencing one or two trips. A single summer working in the fashion industry following graduation was enough to convince Team Camden chaperone Angela Pokorny (FCRH ’11) to switch to community service. “Being in GO! inspired me to join JVC,” said the recent graduate. Pokorny is not the only alumna to have been “ruined for life,” a JVC motto that implies that students exposed to wrenching poverty up close will never be comfortable with injustice. Makenzie Schmitt (FCRH ’09) made a GO! trip to El Salvador and worked with an organization that worked with youth in gangs. Today, Schmitt is a bilingual teacher at Omaha’s Yates Community Center, where the former Spanish major teaches adult immigrants and refugees to speak English. 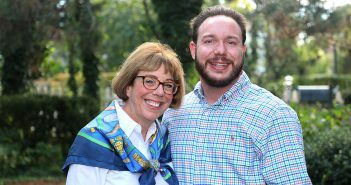 Such dedication by students who find their calling in service inspired Mary Anne Sullivan (TMC ’73) to create the Eileen Ahern Sullivan (UGE ’42, LAW ’46) and Francis J. Sullivan (LAW ’34) Endowed Scholarship Fund. The fund supports one GO! student per year on an immersion trip. It also honors Sullivan’s parents, who raised her to embody the principles and values that are embraced by GO! : belief in community, spirituality, simple living, and social justice. “I was struck that the set of principles to which GO! students subscribe are the same principles my parents raised me to believe in,” said Sullivan, a D.C.-based energy lawyer. “My family members were observant Catholics; before it was fashionable, they were into a whole range of social justice issues—volunteering to help the poor, building community. Because the University supplies only 10 to 15 percent of GO!’s budget, fundraising is a large part of GO!’s student activities. Each GO! team is responsible for raising the money for its trip through various jobs or solicitations. While a trip to Camden is relatively inexpensive at $450, international trips can range from $1,700 to $3,750. Following a day of service, GO! Camden gathers in the spacious living room of the Romero Center for prayer and reflection. Ahn sums up her day working in the Habitat for Humanity ReStore, a 15,000-square-foot warehouse stocked with furniture, fixtures, and appliances. Proceeds support new affordable housing for area residents. Even though Apollonia Colacicco felt sick during her service at the MLK Daycare Center (she was, she admits, hungry from the Welfare Food Exercise), she says she feels rewarded for having won over the two- and three-year-old children with her monster impressions. As the team sinks into the end of their day, they laugh, ponder, and even engage in horseplay. Reflecting on Camden’s many social and economic problems, Martin wonders if their small presence really made a difference in a city where many problems are systemic ones. But the answer seems unanimous among the group, each of whom has come to see volunteer service in a new light. 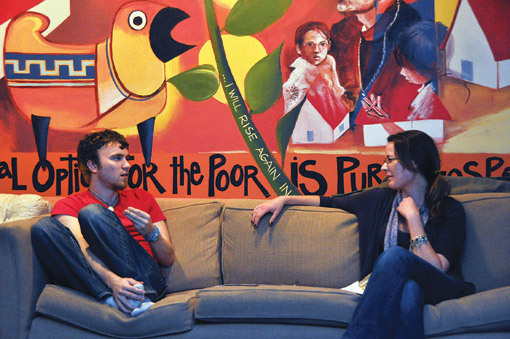 Dan Drolet and Camden Team Leader Angela Pokorny (FCRH ’11) reflect on their day of service in the Romero Center’s lounge.